NEW DELHI (Reuters) – Indian immigrant Imran Khokhar, 27, had dropped off his father at the Al Noor mosque in Christchurch and was still in the parking lot when he heard the screams. He raced toward the mosque doors to reach his father, who was visiting him from India, when locals stopped him from getting close. Inside, a gunman was on a shooting rampage, going on to slaughter 50 people at two mosques in the city. New Zealand authorities are now preparing to release the bodies of victims to their families for burial. However, Imran has yet to get a glimpse of his father’s body, he told his elder brother Altaf, who lives in Surendranagar, in Gujarat. “Why am I not being allowed to see my father’s body?,” an agitated Imran told Altaf, 40, who spoke to Reuters via telephone. Mahebubbhai Khokhar, 65, a retired area manager at a local state-owned power utility in Gujarat, was on his maiden visit to New Zealand with his wife to see their son, who had left India in 2010, Altaf said. 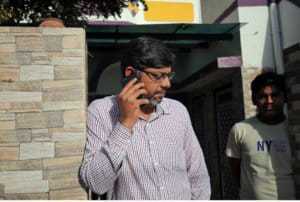 Khokhar was one of the five people of Indian origin confirmed dead by the Indian High Commission in New Zealand. However, the local police had not confirmed Khokhar’s death to the family, Altaf said. Imran and his mother were camping outside the hospital trying desperately to retrieve Khokhar’s body. But there was no progress, they said. “We saw his name on television but the police there are not telling us anything,” Altaf said. Khokhar had been scheduled to fly back to India on Sunday with his wife. Altaf does not have a passport so cannot join his mother and his younger brother in New Zealand. “Nothing is clear to us,” he said. Australian Brenton Tarrant was charged with murder on Saturday. He was remanded without a plea and is due back in court on April 5 where police said he was likely to face more charges.